Area: Full field (if you have it), or half field (put a cone goal on the halfway line). 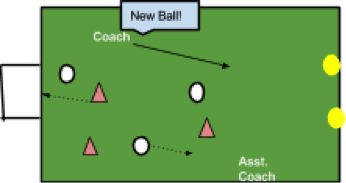 Whenever a ball goes out of play or a goal is scored, a coach announces “New Ball!” and rolls another ball into play. The ‘new ball’ should be rolled to neutral space or toward the disadvantaged team. After a goal, roll the new ball in near the center of the field toward the team that was scored against. Do not bounce the “new ball” as it is difficult for these players to judge a bouncing ball at this age. Favor the team on the wrong end of a one sided game. Favor individual players who are not becoming involved in the game. Have parents retrieve lost balls and return them to the coach who just rolled the new ball in so he/she now has 2 balls once more! Play 3-4 minute halves with a halftime break. This is a fast paced game and they will tire! Remember to put the players in different color pinnies/bibs. Guided Discovery Questions: To be asked one at a time to give the players a rest, or during a water break. Great goal! What part of your foot did you use to score it? Can anyone else do that? Show me! Great move? Show me again. Can anyone else do that? Show me! How did you score that goal? Did you run fast or slow? How do you stop the other team from scoring? Show me!